Travel in Greece can be among the most rewarding experiences you'll ever attempt. But many visitors make common, preventable mistakes when they set foot in this ancient land. 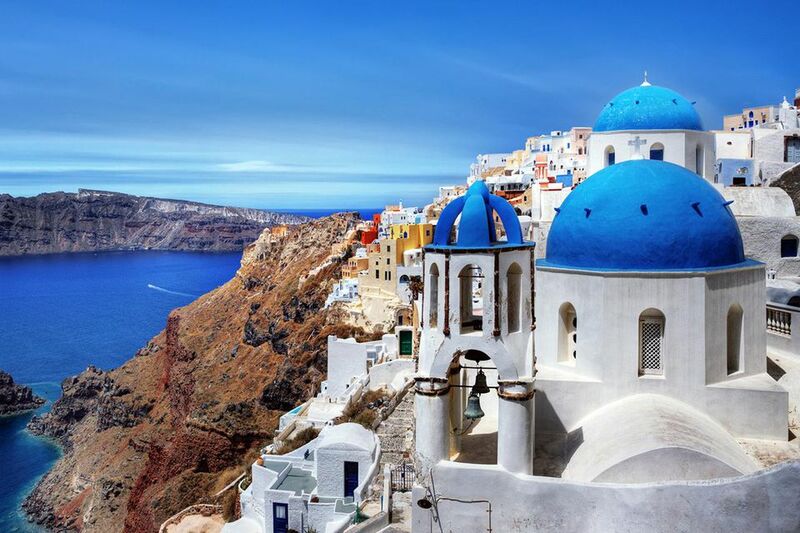 The picture above comes from Santorini and is one of the most famous scenes in all of Greece. The turquoise-topped churches and the whitewashed houses are striking, and you shouldn't miss your chance to take pictures and spend time in such places. But take care not to shortchange yourself by only checking off a few famous spots like this one and perhaps the Acropolis in Athens. Add value to your trip by visiting lesser-known islands where you can observe the quiet everyday existence of Greeks—without having to move so another tourist can take your place for a photo opportunity. You'll see inviting outdoor cafes and centrally located hotels in most tourist spots. Sometimes it makes sense to patronize them. Other times, you might get far more value elsewhere. Find a few English-speaking natives and ask them for their favorite places to enjoy lunch or dinner. Chances are good you'll learn about places the locals patronize. You'll get a better look at daily life and usually much better values for your money. The same can be true of hotels in Greece, although this strategy doesn't always pan out on islands with limited tourist facilities. But there are places where a very short bus ride from the hubbub can land you in a reasonably priced hotel that can become a refuge from the tourist crunch. It's worth investigating. Some approaches to itinerary time in Athens are quite extreme. For a few, the idea is to spend little or no time in the capital. They've been told the air is polluted, the people are rude and the tourist attractions are crowded. On the other extreme, visitors could wind up spending most of their time in Greece right here, missing out on the beautiful islands and the historic treasures of the mountains and ancient cities nearby. Don't sway to either extreme. Give Athens its due and discount some of the negative comments. But don't spend the bulk of your time here if there are opportunities to experience other parts of the nation. Cruising can be a very economical way to encounter Greece, especially for first-time visitors. The cost of transportation between islands is paid before you leave home, and cruise ship schedules are fairly dependable, but that dependable schedule will create trade-offs. If you want to see the sunset from Santorini, chances are good you'll be disappointed. The allotted five-hour stopover probably ends well before dusk. You'll be limited to hours in settings where you'd rather spend days or even weeks. If you do plan to visit Greece as part of a cruise, understand that you'll only be getting a brief introduction to places you will want to revisit in years to come. To do otherwise sets up a budget traveler for disappointment. There are well-established ferry services that run between major islands and Athens. Some of the routes are served with several ferries a day, while runs to the smaller islands might only be scheduled for a few times a week. The schedules can be confusing, and there is often a language barrier to overcome as well. A few people fear they'll get seasick aboard a tiny vessel. Island hopping in Greece can be a rewarding travel experience. For example, booking an overnight sailing to one of the islands could save you the cost of a hotel and add hours to your daily visits. Be aware that simply booking a ferry passage does not necessarily entitle you to a place to sleep or even sit. Ask questions at the time of booking about seating or berths. At times, those berths and the extra comfort they provide can be a valuable investment. When Thomas Cook publishing ceased operations in 2013, it meant the end of annual published updates for the excellent resource Greek Island Hopping. There are plans to create an e-version with updates, but even the outdated copies contain valuable strategies, maps and other information useful to island hoppers. It's a resource worth consulting as you build an itinerary. This picture begins to tell the story of a frenetic bus station, but frankly, it doesn't do the chaos justice. Confusion reigns. Some buses are late, while others are delayed. Drivers have little patience for those asking questions and they shout and gesture to express that dismay. It's important to anticipate delays and cancellations, especially in the off-season. There are sometimes demonstrations or strikes that crop up quickly and cancel a bus or ferry that had been reported as "on schedule" only a short time earlier. Careful planning for a trip to Greece is essential. Allow plenty of time to catch buses, ferries, and airplanes, or you could be stuck with extra expenses and change fees. Driving a taxi in Greece isn't the most rewarding of professions. Pay is low, shifts are long, and the driving is difficult, so it's not always possible to find a cheerful driver who has your best interests at heart. One common problem tourists face in Athens is not having enough small bills and change to make payments. Drivers do not always carry change and you can wind up overpaying if you can't get change at a nearby store. There have been reports of travel scams involving cab drivers here that are also common in other parts of the world. One common ploy is to claim that the passenger's chosen restaurant or hotel destination is sub-standard or even closed. Instead, you'll be taken to a place where the driver receives a kickback from your business. The excavation at ancient Ephesus can be reached by putting into the port of Kusadasi. Connections are possible from Rhodes and other Greek islands. If this can be added to your itinerary, you will be grateful for the extra effort to get there. Ephesus was once the fourth-largest city in the world with more than 250,000 people. Its magnificent multistory library is a sight you'll never forget. Beyond Ephesus, you can visit open-air markets and see carpet weavers and leather workers engaged in their time-honored work. Beware of the sometimes high-pressure sales pitches you'll encounter to buy their products, but enjoy a day or two in Turkey if it fits your itinerary for a visit to Greece.